Would you be interested in learning how high ROI Voice Picking can save $100,000s and provide meaningful business results? 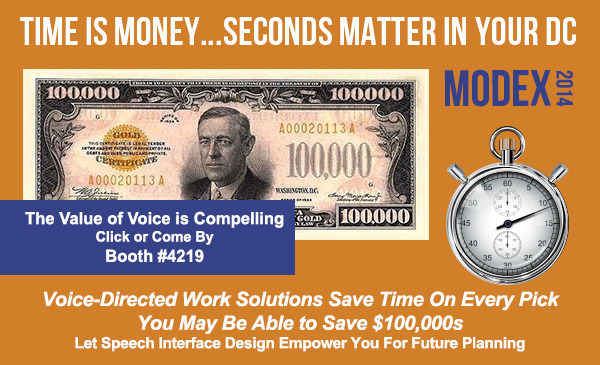 Click or come by Booth #4219 while at Modex2014 to talk with a Speech Interface Design Voice Picking Solution expert. Let us show you how our highly consultative engagement process, consisting of a complementary operational DC walk-through stopwatching your workflows and collecting key metrics, can reveal opportunities for more efficient and effective operations. Subsequently, you'll be presented with a quantified Voice Picking Solution Value and ROI projection report. Click or pick up your free stopwatch, we'll use it to count the seconds - and ultimately the $$$ - Voice will save your operations. RSVP today at www.speech-interface.com/modex2014 to learn how Voice Picking can deliver business results to your operations.